Note: You will be graded on the text below, not the video, as they can sometimes be outdated. Detecting illness or injury in animals, especially wild and non-companion animals, can be difficult if you don’t know what you are looking for. The observer must combine clues from the animal’s overall appearance, behavior, and environment to determine the status of its health. The volunteers here at Big Cat Rescue see each of the animals every day, spend a lot of time around them, and are usually first to alert coordinators to problems. Because of this, it is crucial that everyone be aware of some of the signs that may be an indication of a problem or illness. Please read this class periodically to make certain you are not missing important information that may help get an animal treated before a problem gets serious. All observations regarding the animal including behavior, physical appearance, feces, vomit, and leftover food should be recorded on the Animal’s Observation Log in the left-hand side bar of the BigCat.me site. All observations regarding the enclosure including integrity, fallen branches, low areas needing dirt etc should be reported on the Maintenance Observation Log. Leftover Food: Look for and log leftover food. An animal may not eat or may have leftover food for a variety of reasons including; outside temperature, if the animal is in “heat”, if the animal is sick or injured, or if the animal is simply not hungry. It is important to log detailed yet brief notes including number of pieces, size of pieces, and types of food. Sizes descriptions used to refer to amounts of mush are golf ball, racquet ball, baseball, softball, ½ tube/bag, or full tube/bag etc. The most common foods that may be found are boneless chicken, chicken quarters, necks, beef, mush, and whole prey including chicks, white rats, and rabbits. Feces: Look for and log unusual feces. Note the consistency, color, and odor. Include details like soft, runny, watery, bloody, or mucousy. Sometimes the feces may have visible parasites in it. If this is found notify your coordinator so they can inspect the feces. If you cannot find feces, notify the volunteer double-checking the area. If after double-checking feces is still not found report this on the Animal’s Observation Log. Vomit: Look for and log vomit. Note the consistency and color including details like foamy, watery, yellow, grassy or food. Specific details describing the vomit are helpful to the veterinarians to determine cause of illness. Predation: Remains of a kill should be logged. Periodically, an unlucky guest may wander into a cage and sometimes eating such animals can make the cats sick. Look for: birds, wild rats, opossums, raccoons, frogs, lizards, snakes etc. If remains of a kill are found you should notify the coordinator to inspect the remains. The remains should then be disposed of in a new garbage bag. Enclosure: Walk the perimeter of the enclosure and observe the animal’s direct environment. The entire perimeter of the enclosure must be walked both when cleaning and when double-checking the enclosure. Check that the walls, roof, entry doors, sliding doors, and water bowls are sound and in working order. Ensure that the entry doors are locked. If a door is found unlocked, lock the door and report the unlocked door to the coordinator. Log any repairs needed on the Maintenance Log. Vegetation: Vegetation that needs to be removed from an enclosure should be logged on the Maintenance Log. This includes over growth of the general grass and plants as well as any toxic or nuisance plants such as cater plants, nightshade, or bur plants. Check for evidence of plants eaten recently, particularly large amounts of vegetation that has disappeared and report this on the Animal’s Observation Log. Smell: Strong smell in the cage can be from rotting food, diarrhea, vomit, or remains of a kill. If you cannot locate the source of the smell notify your coordinator. Please note that there are fly traps affixed to many enclosures and these do create an unpleasant odor. Animal Behavior: Observe the animal’s behavior and log health issues, injuries, or abnormal behavior. An animal that will not come out of it’s den or is hiding (especially those that typically come out) is considered behaving abnormally. If the animal is atypically aggressive this too would be abnormal. Both may be indicators of illness or injury. Animals in the wild will try to hide a “weakness” (i.e. illness or injury) in order to protect themselves from predators. Observe the animal and note if it is bright and alert or dull and lethargic. Behavior observations that should be reported include; hiding, aggressiveness, neck arching, head bobbing, odd body position, hunching, limping, etc. Time of Year or Day: During the hottest months, the cats are more likely to be less active and even appear to be lethargic. The cats are more active in the cooler morning hours and at feeding time. Coat: Look at the animal’s coat to ensure that it is shiny, clean, and appears to be well kept. Note if it has recently changed and is thinning and dull or matted. Look for anything in the fur—mud, debris, sand burrs, blood, or urine. Hot spots are red patches created from constant licking this could indicate an allergy or fleas. Please note that some animals have chronic hot spots. In some cases these do not need to be reported. Check the top of the Animals Observation Log for any chronic health issues that do not need to be reported unless worsening. Eyes: The animal’s eyes should be clear and alert. Look for any discharge and note which eye and what color the discharge is. If the animal is rubbing or scratching at its eye(s) note which one. If the animal has an injury or is ill the animal’s third eye lid may be exposed. This is the white colored lid that is located in the inner corner of the eye. Note any swelling of the eye, surrounding area, or lid. Nose: The animal’s nose should be clear and slightly moist. Look for any discharge and note which nostril and what color the discharge is. Listen for any sneezing and take note of the frequency. Note any swelling of the nose. Mouth: Look for and note excessive drooling or foaming of the mouth. Sometimes drooling or foaming could be an indicator the animal has just vomited or is about to. Is the animal is licking and making a “smiling face” or “fleming face” or is pawing at it’s face this could indicate that the animal has a stick or bone stuck on the roof of it’s mouth or in it’s teeth. Note any swelling around the mouth or cheeks. This could indicate an abscessed tooth. Breathing: The animal should be breathing in a calm and rhythmic pattern. Abnormal breathing would be considered fast, shallow, quick, labored, or irregular pattern. Listen for coughing or wheezing and try to determine if the sound seems to be coming from the throat or chest. Note if you hear wheezing upon inhaling, exhaling, or both and if it sounds dry or loose and gurgly. Gait: Observe the animal walking and take note of any limping or favoring. Be sure to indicate which leg front or back and which side left or right. Look for swelling or wounds on the legs and paws. Chronic Health Issues: Some animals have chronic conditions that do not need to be reported on the Animal’s Observation Log. For instance; Cybil the serval has a permanent leg injury, Jumanji and Jade have chronic allergies, and several cats have chronic limping and arthritis. If an animal has a known health issue it will be noted at the top of the Animal’s Observation Log. There is no need to report it unless the health issue has worsened. Miscellaneous: When the animal is out in view take a moment to look over the entire body and inspect for any lumps, bumps, cuts, blood, missing fur, etc. An animal that is missing fur or is observed scratching may have fleas or an allergy. Something Is “Just Not Right”: Often we can’t identify a specific problem but we know something is wrong. If you are not sure about what “normal” is for a particular animal, try to find another member of its species with which to compare it or ask your coordinator. Abnormal Symptoms: If you observe what appears to be an abnormal symptom in an animal look around to see if any other animals in the near vicinity have any of the same symptoms. If cleaning, do not touch another animal or enclosure until you have cleaned all tools, emptied your bucket, and changed gloves. If the cat is ill, we need to avoid the possibility of spreading the disease. Always report any abnormal symptoms to your coordinator and log on the Animal’s Observation Log. 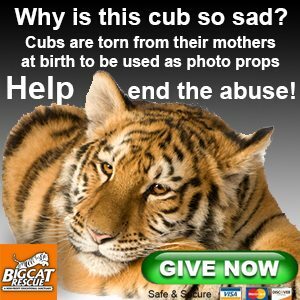 Questions: Please remember, the volunteers at Big Cat Rescue play a crucial role in keeping our animals happy and healthy. If you ever have questions or are not sure about what you see, just ask your coordinator. It is better to be overly cautious and so that you can you learn as much as possible. If you cannot find the animal in its enclosure. If the animal is in distress or danger. If animals are fighting (in extreme situations turn the hose on the animals to break up the fight). If an animal is discovered with a severe wound. If the structural integrity of the enclosure has been compromised or is at risk. Do not record any of these situations on the observation logs without first immediately contacting the above. Log all observations before leaving the property at one of the volunteer computers. Click on the Google ball icon on the desktop and log in to your account for the BigCat.me site. You will be granted access to the observation charts after taking the Animal Observation Class. Observations are recorded on the logs located under the heading Observations in the left-hand side bar of the BigCat.me site. Choose the appropriate observation log either By Cat Name for any observations regarding the animal or Maintenance for any observations regarding the enclosures or grounds. To add observations choose the appropriate observation log and navigate to the correct page. Click the button that says ADD ITEM located at the top of the page. Use the drop down menus on the form to best describe your observation. The notes field is where you can add more detail to explain your entry, such as the plant was night shade, the area of the enclosure that needs attention, the odd behavior of an animal or other important details. Fill in all parts of the form including your name and then click SAVE. Make your notes as objective and concise as possible. Example of appropriate entry: Favoring right front leg. Example of inappropriate entry: It looks like his foot hurts. Each logged observation has a place for a check mark next to it from either the Vet or Staff. These checks will be added once the observation has been addressed.